My recipe for Slow Cooker Creamy Tomato Soup was featured on the link party Simply Create Thursdays at Simply Create & Design. 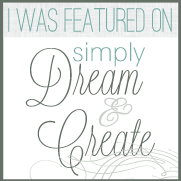 I want to thank Stephanie at Simply Create & Design, I greatly appreciate it. It’s always nice to be recognized by a fellow blogger.